Home Supplies Why Should You Buy a Dog Bed? Why Should You Buy a Dog Bed? Just like us, our canine companions also love good, comfortable beds. Does your beloved Buster love to take a nap on your furniture? If the answer is affirmative, then it’s the time to find him a quality dog bed. Not only with you provide the pooch with a cozy place of his own, but you’ll also save your expensive Italian sofa from scratches and stains. However, buying a bed isn’t that easy, especially if you don’t know a lot about these things. In fact, there are a few factors that are necessary to keep in mind when looking for one. Fortunately, we’re here to help you out – this guide provides an outline of all things you need to know before purchasing an indestructible dog bed for your four-legged friend. Read on! As you probably already know, pups are territorial by nature. They also gravitate towards the same areas of the owner’s home to sleep, nap, and relax. For that matter, having a product of a perfect size will not only enhance the pup’s comfort but also give him a special place that will be just his own and nobody else’s. One important thing to remember here is that dogs sleep for about half a day (12 hours). It’s yet another reason to provide your pooch with an easily-accessible place for napping. Have you ever woken up with two paws pressing your back? If the answer is affirmative, then you know how losing the personal sleeping place to a dog feels like. Sleeping together with your pet can be fun and adorable, but can also become quite irritating after a while, mainly if your pet can’t stop twitching and turning. But with a unique bed just for him, that won’t be a problem anymore. You won’t have to feel guilty for leaving your pooch down on the floor – he’ll have a cozy place of his own, and you’ll be able to sleep without disturbances. Furthermore, you won’t have to worry about the fur that your canine companion leaves behind, which can cause serious respiratory problems to some people. Today’s market offers a variety of premium pet beds, coming with things like support systems and advanced foams to keep Buster comfortable while he’s napping. An owner can sleep easier once he knows that his pet is as supported and comfortable as he is. Furthermore, a product of premium quality can also provide the pet with the necessary protection from the weather. If you, for example, live in a hot climate, you can easily purchase a cooling dog bed that will protect your canine from overheating. For colder climates, on the other hand, a quality electricity-heated model is your best option. Sleeping on the floor during hot summers and cold winters is not good for your pet – it can lead to all kinds of illnesses. This is especially pronounced if your dog is of a breed that’s prone to temperature changes. If he is, don’t hesitate and get him a quality product as soon as possible. Other than the illnesses caused by sleeping on cold and hot surfaces, sleeping on the flat or uneven floor can lead to many other kinds of unhealthy conditions. It can have a very adverse effect on the pup’s postural health, and can also lead to restless and erratic sleep. Sleeping on such surfaces is particularly unhealthy for the old and overweight dogs that already have enough problems with their bodies. This is why it’s of paramount importance to get your pet some bedding and prevent him from sleeping in places that are uncomfortable and unhealthy to sleep on. A lack of proper sleep is something we’re all familiar with, and we don’t want something like that to our pets on a daily basis. Dogs like to sleep on our couches and sofas, and they don’t know how expensive some pieces of furniture can be. A quality model will prevent Buster from doing this – he won’t have to jump up onto the furniture anymore but only go to his cozy little bed and lie down to sleep or relax. Jumping up and down from your tall furniture isn’t exactly good for the dog’s limbs, which is yet another advantage of getting him some specialized pet furniture. We should also mention that these products are much easier to keep clean. Most of the models come with covers that can be removed and washed in the washing machine, making the whole process as fast and easy as possible. How to Choose a Bed for Dog? This kind of material is inexpensive and very easy to add to the bed, no matter its shape or size. The aromatic chips (like cedar, for example) are capable of absorbing the dog’s odors and can also repel fleas. Even though they offer a pretty good amount of padding, the wood chips aren’t as comfortable as some other types of fillers. Furthermore, they don’t provide a lot of support to injured and old dogs, and some pets might even find their smell irritating. Aromatic chips can have an adverse effect on the sense of smell of hunting dogs. The polyester fill, or fiberfill, is well-known for its use in taxidermy and pillow-making industry. It doesn’t have the firmness of the other materials but successfully adds softness and bulk to a dog bed. Just like the wood chips, the polyester fill is cheap and very easy to use, which makes it an excellent choice for the beds that require frequent refilling. The polyester fill is also capable of holding onto odors and can clump up once it’s washed. Its main downside is that compacts over time and that it can turn into a massive mess if your four-legged friend decides to rip it open and thus scatter the filling everywhere around the house. Old blankets, sheets, t-shirts, towels, and other similar items (unusable fabrics) can be easily torn into small strips and then be used as a filling. This doesn’t only save money, but it also stands as the most eco-friendly option – it benefits the environment by keeping these old clothes out of the landfill. In case your pet has an accident or picks up an odor, the recycled filling can be washed and reused. Those who don’t have the time to tear these fabrics into strips can fold them and stuff them into the pup bed. Several types of foam could be considered as ideal bed fillings. These include pellets, sheets, foam chips, and memory foam. Pellets and chips, for example, are used in a way that’s very similar to that of the wood chips, although they can provide the pet with much more support and softness. Furthermore, they enable the bed to contour to your pup’s body every time he decides to take a nap. Foam sheets (either regular or memory foam) are a bit more challenging when it comes to replacement and cleaning (taking them in and out can be difficult), but they offer outstanding support. They’re an excellent choice for the pets with injuries and the senior dogs with arthritis. Even though that largely depends on the comfort level they offer, the standard beds are usually the most affordable option. Typically, these look like large cushions, but with a softer top and some extra padding. They’re an excellent choice for the large canines, as they usually don’t have “fences” that make sleeping uncomfortable for them. They come in various shapes and sizes, with most of them having covers that are removable and machine-washable. They’re not your best choice if you’re an owner of an older or weaker pooch. He or she might have difficulties with getting up due to the bed’s extreme plushness. Unlike their doughnut-shaped cousins, these feature a look that’s more structured. The reason behind that is that they have a plastic surrounding with a soft fabric on the inside layer. Most breeds find these types of products extremely comfortable, and we don’t even have to mention the adorable look of a dog nestled inside such a bed. The bolsters or rims on these beds usually surround the whole bed, but on some there are no rims on the frontal part, giving the pup an easy-access to the sleeping area. As you can already guess, these are designed for canines with orthopedic issues. They’re typically made out of premium-quality foam and provide the pooch with some extra support. They also put less stress on the pup’s joints, which makes them an ideal choice for the canines with arthritis. Even though they’re comfortable enough for all breeds, thinner and older canines are bound to benefit the most from sleeping inside this type of a bed. Unfortunately, they’re a lot more expensive than most products of this kinds, but that shouldn’t be an issue if you want the best for your senior four-legged companion. These look just like the dog houses that you can see outside people’s homes, but they’re a lot comfier and offer a much warmer and cozier experience. In simple terms, a covered bed is a sort of a small, plush retreat for your canine friend. This model is an excellent choice for all types of dogs, especially for smaller breeds. They’re a unique and cute way to provide your pet with his special place. This model has a look that’s very similar to that of the human beds – if they weren’t that small, the pet parents could easily confuse them with their beds! This allows the owners to match the look of a pooch bed with theirs, especially if the house aesthetics are essential to them. The thing that makes them quite pricey is that they’re made out of materials such as metal and timber, as well as the fact that they can have a customized look. These are manufactured to easily fit inside a dog cage or a dog kennel. They provide the canine with a very comfortable experience, giving them a “safe place” with its own little roof. This makes them a convenient choice for the owners of puppies. Furthermore, these models are quite easy to keep clean. Almost all of them come with machine-washable covers and are made out of water-resistant materials. Those that enjoy traveling with their pets should consider purchasing a travel bed. These are quite similar to the standard models, with the exception of being foldable and easy to transport. This turns them into real space-savers when it comes to traveling by car. These are the most frequently used type of bedding, and also the cheapest. They are made from a variety of materials and can be quite comfortable, although not as much as the previously-mentioned models. 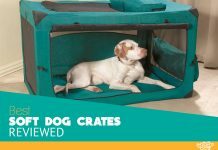 Typically, they’re machine-washable and can be used inside crates and kennels. Making sure that your furry friend has an excellent spot for relaxing and sleeping is among the easiest concessions one can make. Choosing the right dog bed makes all the difference, and it’s certainly a small price to pay for the happiness and love that pups bring into our homes. So pick a good one, and let your pooch sleep in comfort and style. Previous articleWhich Type of Toy is Right for Your Pooch?